Daytonian in Manhattan: The James Forrester House -- No. 202 Bleecker St. Among the country estates and farms around Greenwich Village in the years following the Revolution was that of Anthony Bleecker. A wealthy shipping merchant and amateur poet, he was a personal friend of George Washington, Governor De Witt Clinton and other influential men of the time. In 1808, decades before the little hamlet of Greenwich would experience its population and building boom, Bleecker and his wife deeded a large parcel of their land to the city. The east-west road that ran through the property was named Bleecker Street. Following the creation of the Commissioners’ Plan in 1811 that resulted in the grid of streets and avenues, 6th Avenue appeared (at least on paper for now) on maps. Bleecker Street would go no farther west than 6th avenue until 1829 when merged with Herring Street. 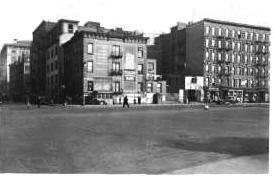 As the village grew in the 1820s Sixth Avenue created a dividing line of sorts with the wealthiest citizens building on the east side. Although there were fine homes and even mansions to the west, George Rogers' exquisite brick-and-marble mansion built on Washington Square in 1828 would set the high-end tone for the area to the east. Two years before Rogers' mansion was completed, a row of elegant matching Federal-style homes was erected on the southern side of Bleecker Street, stretching east from Sixth Avenue. The red brick residences were trimmed in white marble and bore noticeable similarities to the Rogers mansion. Marble was used for the tall stoops (decorated with carved panels at the bases); the wide, arched entrances; the sills and carved, paneled lintels. Two and a half stories tall, they sat atop deep brick English basements. The new owners would have filled the homes with furniture from New York’s best cabinet makers, imported china and silver and costly carpets. That year the Society reported that in the past twelve months it had spent $5,313 “in the purchasing of wood, food, etc., and given to different persons deserving of charitable assistance.” That figure would amount to about $120,000 today. While the Trulock family was in No. 202 Bleecker, young James C. Forrester was establishing his medical practice. After serving as house surgeon at Bellevue hospital from 1832 to 1835, he opened his own practice on Carmine Street, a block west of Sixth Avenue. Forrester seems to have had a relatively comfortable work schedule. He received patients between 8 and 9 a.m. and from 5 to 7 p.m., giving him ample time to run for coroner in 1843—an election he lost. Forrester never attempted public politics again. The Forresters had one son and three daughters in the Bleecker Street house. Despite his substantial wealth, their father had little interest in idling time away in posh mens’ clubs. Instead he focused his energies on charitable and medical groups. For many years he was president of the Board of Trustees of the Northern Dispensary, was a member of the Medico-Legal Society and of the Association for the Relief of Widows and Orphans of Medical Men. The Medical Board of Bellevue Hospital seems to have been somewhat surprised in January 1854 when Forrester resigned as Visiting Physician. If the resignation created free time, it was filled a year later when on January 20, 1855 the Executive Committee of the Webster Fire Insurance Company appointed him a director. By the time Dr. Forrester died the Bleecker Street neighborhood was changing. Manhattan’s wealthiest citizens were moving northward up Fifth Avenue. By the turn of the century, little would remain of the exclusive residential street. In the meantime, however, Joseph Laemmle and his family moved into No. 202 Bleecker Street. The highly-ambitious Laemmle was a leader in the dairy industry. In 1899 he enlarged the house to a full three stories (matching the height of No. 200 next door which gained a third floor in 1876). His bravado prompted him to install an updated Victorian cornice complete with his highly-visible name. In 1906 Laemmle was one of three partners to incorporate The White Clover Farms Company, and was President and Director of the Laemmle Dairy Co., and Director and Treasurer of the Consolidated Milk Exchange. The social reform movement that swept the country at the turn of the century was nowhere more evident than in Greenwich Village. Down the street from the Laemmle residence, Darius Ogden Mills had demolished a row of mansions in 1896 to construct his Mills House—a hotel for unemployed men down on their luck. It was a time when the plight of the poor and their quality of life inspired improvements in work, living and health conditions. By October of that year the Laemmle family was gone from No. 202 Bleecker Street. Instead Joseph Malite, a manufacturer, was living in the house. He was nominated by the Republican Party that month for a seat in the First Assembly District. As the years passed, the population of the neighborhood became highly Italian. The nearby churches of St. Anthony of Padua and Our Lady of Pompeii celebrated mass in Italian as New York’s Little Italy neighborhood expanded. In 1920 the old houses at Nos. 196 and 198 were replaced with the Church of the Gospel, a settlement house serving the Italian neighborhood. By 1940 the house at No. 202 Bleecker was home to several immigrant families. The census that year showed 48-year old Emilio Zullo living here with his wife, Christina and their six children—Olga, 29; Ida, 22; Antoinette, 20; Peter, 26; Charles, 17; and 10-year old Anthony. Also in the house was Joseph Marullo who, at 31, was 22 years younger than his wife Gaecienta. They had three sons ranging from 23 to 27 years old, and two daughters, Elvira who was 19, and 15-year old Filomena. In 1937 the Church of the Gospel had been taken over by the Little Red School House, an experimental school that emphasized real-life learning, such as field trips; as opposed to classroom studies. Fifty-five years later the successful school enlarged by purchasing the two Federal mansions at Nos. 200 and 202. The gracious Federal interiors of No. 202 Bleecker Street disappeared long ago. But the exterior, albeit slathered with dark red paint, is surprisingly intact—a glimpse into a gracious period of Greenwich Village life nearly two centuries ago.